The time to begin vendor validation and gather tax and payment information is before the vendor has provided a product or service, not after the invoice has been received and is to be paid by accounts payable. 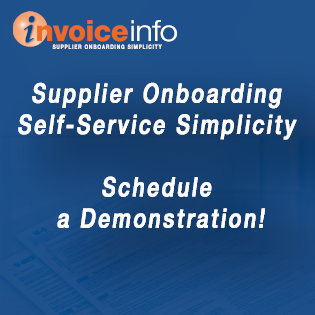 07 Sep When Should Vendor Onboarding Begin? Vendors. You need them. More accurately, you need what they provide, be it product or service. And therefore you interact with them as the providers of the things you need to do what you do. They are anxious to interact with you — to provide services or products — in order to generate revenue. The term “vendor” can encompass everything from major material suppliers to various service providers, to the local bagel shop supplying food for team meetings. How you engage them will vary according to their role. But to transact business involves not only validating them as a going concern but also obtaining information from and about them. That is not just information on how and where to remit payment (which they’ll probably be sure to put on the invoice). It includes agreeing to terms and payment method; ensuring that they are not a sanctioned entity; and it includes understanding their tax status and obtaining their tax ID number (TIN). Bottom line upfront: The time to validate a vendor and gather their tax and payment information is before the vendor has provided a product or service, not after the invoice has been received and is to be paid by accounts payable. Those who’ve re-designed their entire procure-to-pay (P2P) process understand the need to smartly align steps. The whole point of P2P is, having analyzed the end-to-end process, to assign tasks and procedures to the right personnel in the right sequence to optimize that process. Companies may not all do it exactly the same way in terms of assigning responsibility. But with regard to sequence, there are certain practices that are best. One of these is vendor onboarding. The best time to gather and record requisite vendor information is at the start of the relationship. Many organizations, particularly those that have yet to redesign and optimize their procure-to-pay activities, end up hastily validating and entering a vendor into the master file after an invoice shows up requesting payment. That’s not to say necessarily that the vendor has not been vetted by purchasing (at least as far as its capability to provide what the company seeks). But too often, accounts payable may have no notice of a relationship until the vendor’s invoice arrives. Worse still is actually paying the vendor before having obtained the necessary tax information. Payment is your final leverage in the relationship. Once you’ve paid, the vendor will be in no hurry to get the information to you. Any payables personnel who have been through a 1099 season understand this. That’s why a well-designed P2P process will include in its policies and procedures (P&Ps) a vendor onboarding process up front. It will entail payables working in concert with procurement, before the vendor has provided product or service. That means things like getting the vendor’s W-9 (or W-8); understanding and designating sales tax applicability; obtaining and recording bank account information for ACH payment, card payment acceptability, or remit-to address; and running a check against the government sanction lists. Those P&Ps will include the steps and tools (utilizing vendor information forms along with W-9 requests) to enable and ensure the vendor’s information is in hand and that when the time comes, the vendor can be paid per terms while the company is compliant with all applicable requirements.